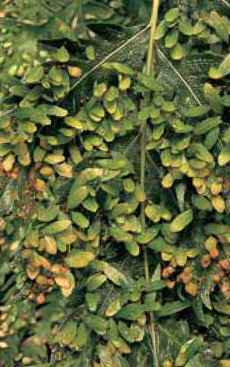 Plantlets crowd the fronds on Woodwardia orientalis var. formosana at the Miller Botanical Garden. Stock plants for commercial production, Sundquist Nursery, Poulsbo, Washington. 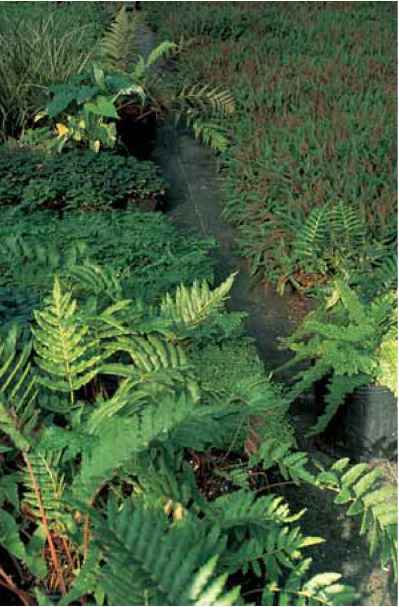 Clockwise from bottom, Blechnum chilense, Adiantum venustum, Blechnum penna-marina, Polypodium scouleri, and Polystichum setiferum 'Plumoso-multilobum'. These ferns all lend themselves to vegetative increase. Photo by Nils Sundquist, Sundquist Nursery. Multiple crowns suitable for dividing. 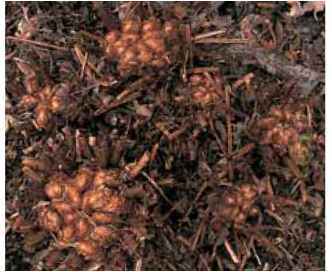 rhizomes, dennstaedtias, are all easily multiplied in this manner. 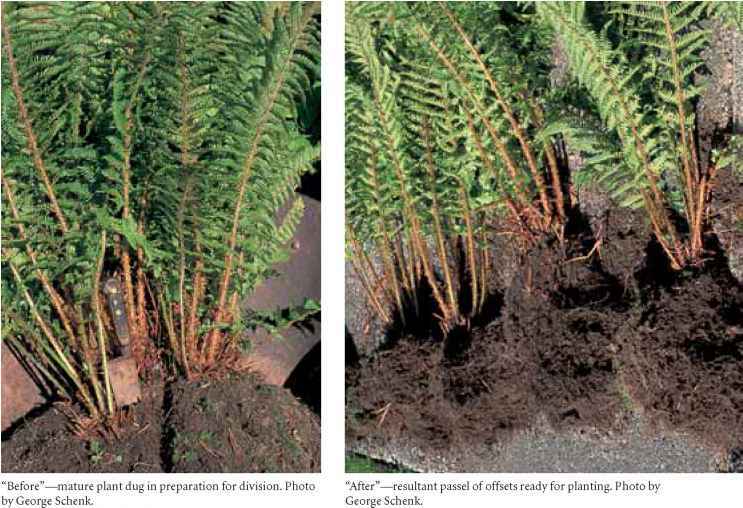 Ferns with short-creeping and branching rhizomes with multiple growing tips are also candidates for division. These are your clump-forming rather than crown-forming types and include such gardenworthy specimens as Athyrium niponicum 'Pictum', Adiantum pedatum, Adiantum aleuticum, most cystopteris and cheilanthes, and a number of dryopteris. Cut these apart by taking a portion of the live growing tip(s) with roots and some fronds. To ease the transition cut back some of the foliage, or do the dividing in the fall or before the appearance of new fronds in the spring. 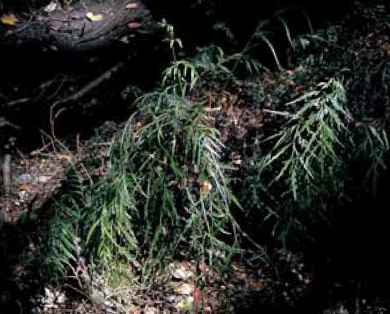 Stoloniferous ferns with rhizomes on steroids, such as Matteuccia struthiopteris (ostrich fern), will happily go forth and colonize, with new plants appearing at some distance from the parent. These can be dug as individuals and easily reestablished (or graciously given away to a friend in need of instant landscaping). I bought one Matteuccia some 20 years ago, and left it in its pot over the winter. It eventually found a home but not before the stolons escaped from the pot and made their way into the surrounding garden. Every spring two or three babies still doggedly appear at the original site and every spring I still doggedly dig them up. clump, clean it, and cut off the new crowns with an appropriate portion of root material to support the offspring (Archer 2005). In areas with mild winters, fall is an ideal time to divide, but my friends in colder areas prefer to operate in early spring. With either time line, the foliage should be thinned to reduce stress on the roots. Incidentally, left undivided, these same, multi-crowned plants can form massive specimens that are incredibly handsome, so choose wisely before taking knife in hand.